The only portable wet/dry vacuum and steam cleaner in one! The Vapamore MR-50 Portable Wet/ Dry Steam Vac has countless uses in the home, in your vehicle, and in your office. It's excellent for cleaning up pet stains instantly, before they become set in. Vapamore’s MR-50 first vacuums up the liquid, then the steam function penetrates fabrics and carpets to saturate and sanitize, and finally vacuums up all remaining liquid. The odor and the wetness disappear! In your car, the MR-50's compact size makes it easy to clean up spills without pulling out a full size wet/dry shop vacuum. The Vapamore MR-50 Portable Wet/ Dry Steam Vac produces 210 degree steam in order to sanitize surfaces while it's cleaning. This green cleaning technology uses only steam to eliminate stains. There are no residues or harsh smells left behind. 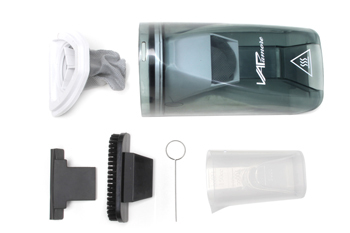 The handheld steam vac eliminates the need for multiple surface cleaners. The Vapamore MR-50 Portable Wet/ Dry Steam Vac has a compact design that is lightweight and easy to handle. At only 4.8 lbs, the MR-50 is easy to store and transport. This is an excellent portable steam cleaner for an RV or office. Vapamore stands behind every product they make. The Vapamore MR-50 Portable Wet/ Dry Steam Vac has a one year warranty. Every purchase comes with Vapamore's excellent customer service, should you ever need it. Clean, steam, and sanitize with the Vapamore MR-50 Portable Wet/ Dry Steam Vac! 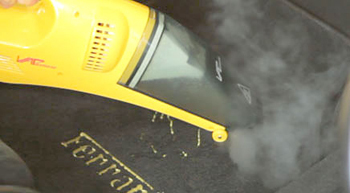 The handheld MR-50 Steamer Vacuum is ideal for auto detailing. 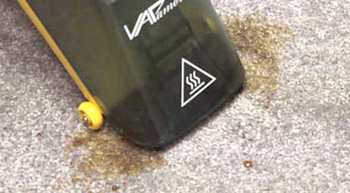 The Vapamore Steamer Vac cleans up dry and wet messes. This item ships from the manufacturer via ground service and can only be shipped to the 48 contiguous states. Expedited and international shipping are not available.